There's never a dull day in Stanley, and if you haven't been here to see it yourself, you've probably heard about North Dakota on the news: a land of endless high paying jobs, a thriving economy and a bright future. North Dakota is booming and Iowa Tanklines is too! By the end of 2010, oil production rates reached 458,000 barrels per day, outrunning the capacity to ship oil out of our region. Oil operations continue to pop up seemingly "out of nowhere" but are attributed to massive oil filled rock called Bakken Shale Formation. This formation lies below ND and provides unfathomable amounts of oil as a result of FRACing technology. In North Dakota, Iowa Tanklines hauls water and crude oil to and from these FRACing sights. Since FRACing is the prevailing method through which oil is attained here, one can imagine why Iowa Tanklines-Stanley is growing their business and making plans for a new location this spring. For the time being we reside in a four room office building with a two bay shop just off of highway 8 in Stanley, ND. 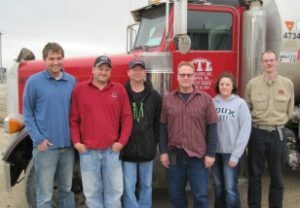 Iowa Tanklines is proud of its reputation as a safety conscious company, requiring more than the required equipment inspections and a clean driving and work history from all employees to remain on staff. Such standards protect the men and women who work for us and ensure that you can be proud to call Iowa Tanklines your employer. ITL has collected an eclectic band of employees to meet the needs of their growing business: from ND raised Iraqi veterans, financial coordinators, elementary school teachers and experienced oil patch personnel, you are in the hands of a capable and friendly crew. We are currently accepting applications for a myriad of positions, some of which include diesel mechanics and owner operators. Join our 70+ fleet today and receive competitive wages and the peace of mind that comes with knowing you are working with an established company who cares about keeping their staff safe and content.